If you’re a Greek national living or travelling abroad, it can be frustrating to find that a lot of online Greek TV content is blocked from outside the country. 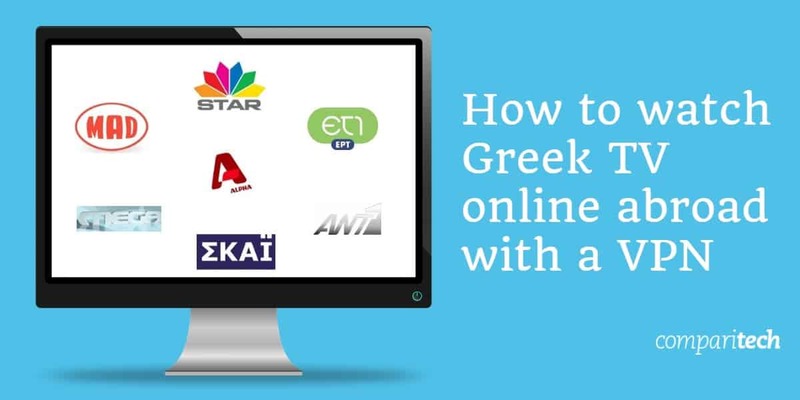 Using a VPN, we’ll show you how you can watch Greek TV online from abroad. While traveling abroad, you’ve tried to watch your favourite Greek TV shows online and found them to be unavailable. That’s because a lot of online content is geographically restricted and only available in certain countries. So how does a VPN (Virtual Private Network) help with this? A VPN encrypts your device’s traffic and routes it through a server in another location. In doing so, your device’s IP address is replaced by that of the VPN server. For example, if you want to watch Greek TV from outside Greece, you should connect to VPN server inside Greece. With a Greek IP address, you’ll be able to stream Greek TV abroad. A VPN is therefore great for unblocking content, and it can also protect your online privacy. ExpressVPN: Unblocks Greek TV from Alpha and ANT1. Fast and reliable VPN with servers in 94 countries. User-friendly apps, 24/7 live chat support and secure with encryption. NordVPN: Stream Greek TV such as Alpha. 5,000+ servers worldwide for unblocking geo-restricted content. Use on up to 6 devices. 24/7 support and secure with a no-logs policy. CyberGhost: Plenty of fast servers in Greece for watching Alpha, Star and more. Connect up to 7 devices simultaneously. Secure with a no-logs policy. IPVanish: Reliable VPN service for streaming Greek TV abroad. Unblock Alpha, ANT1 and more. Highly secure with encryption and allows up to 10 connections. PrivateVPN: Fast servers for streaming Greek TV as well as Netflix. Use on up to 6 devices simultaneously. Strong security with encryption and no-logs policy. Choose a VPN service with servers in Greece – we particularly recommend ExpressVPN for watching Greek TV online abroad. Download the VPN software, making sure to select the appropriate version for your device. The best VPNs offer a wide range of apps and browser extensions. Clear your browser’s cookies. This ensures that the website you’re trying to access forgets your true IP address and location and accepts that of the VPN. Open the VPN app or browser extension and connect to a server in Greece. Go to the website with geo-restricted Greek TV content. The content should now be unblocked. If not, it’s worth trying another server or contacting your VPN’s support. ExpressVPN is a VPN that excels in all areas, making it ideal for watching Greek TV abroad. Aside from having servers in Greece, ExpressVPN has over 3,000 servers in 94 countries. This means that you can not only unblock Greek TV content from Alpha and ANT1 but also the likes of Netflix, DAZN and Hulu. We’ve tested ExpressVPN’s servers extensively and found the service to be as reliable as it is fast. You can stream Greek TV online abroad with ExpressVPN with no buffering or lag. It’s easy to do thanks to ExpressVPN’s user-friendly apps. You even have the option of browser extensions which are undoubtedly quick and convenient to use. While issues are unlikely, ExpressVPN offers 24/7 support with a live chat feature. Our experience with ExpressVPN’s support is that they are quick to reply and highly helpful in their answers. A VPN is highly recommended not only for unblocking geo-restricted Greek TV content but for keeping you safe online. ExpressVPN uses 256-bit AES encryption to protect your data wherever you are. Other important security features include a kill switch and split tunneling, while protection from DNS leaks is also offered. Headquartered in the British Virgin Islands, ExpressVPN doesn’t keep any logs from which its users could be identified. ExpressVPN is available for the following: Windows, Mac, Android, iOS, Linux and routers. Chrome and Firefox browser extensions are also available. What’s more, ExpressVPN’s MediaStreamer is a DNS proxy service that allows you to unblock content on game consoles and smart TVs. BEST VPN FOR GREEK TV:ExpressVPN is our top recommendation. Unblocks most greek TV content including Alpha and ANT1. Fast, reliable servers in 94 countries. User-friendly apps, excellent 24/7 support and secure with encryption. Includes a 30-day money-back guarantee so you can try it risk-free. NordVPN has over 5,200 servers globally, six of which are located in Greece. We found they work well for unblocking Greek TV outside Greece, including the likes of Alpha and Skai TV. With servers in 60 countries, NordVPN can also unblock streaming services such as Netflix, Amazon Prime Video, and HBO GO. With so many servers, NordVPN is excellent for streaming as it suffers less server congestion than many VPNs. A number of features make NordVPN a great value VPN for watching Greek TV online abroad. In particular, you can use it on up to six devices simultaneously. What’s more, NordVPN provides 24/7 live chat support. When it comes to matters of security, NordVPN ticks every box. Offering 256-bit AES encryption, DNS leak protection and a kill switch, it’s highly secure. A no-logs policy ensures your data remains private to you. You can download NordVPN apps for Windows, Mac, Linux, Android, iOS and Android TV. There’s also the option of browser extensions for Chrome and Firefox. Manual setup is required for routers. GREAT VALUE VPN:NordVPN is excellent in all areas, offering great value for money. Watch Greek TV abroad including Alpha. It’s secure, includes live chat support and lets you connect up to 6 devices simultaneously. 30-day money-back guarantee. CyberGhost has 11 servers in Greece – more than most VPNs on the market today. Overall, more than 3,700 servers make up CyberGhost’s network. This is a fast and consistent service that works well with Greek TV channels such as Alpha and Star. CyberGhost offers unlimited bandwidth and traffic, making it a good option for streaming and torrenting. You can test this for yourself risk-free as CyberGhost offers a substantial money-back guarantee of 45 days. One feature of CyberGhost that particularly stands out is that you can have simultaneous connections on up to 7 of your devices. Furthermore, the apps are well-designed and easy to use while 24/7 live chat support is available should you need it. Users are well protected when using CyberGhost thanks to the strict no-logs policy in place. CyberGhost also offers DNS leak protection, 256-bit AES encryption and an automatic kill switch feature. CyberGhost is available for Windows, Mac, iOS, Android, Amazon Fire Stick and Android TV. You can also download browser extensions for Chrome and Firefox. However, Linux and routers require manual configuration. 11 SERVERS IN GREECE:CyberGhost has lots of fast servers in Greece for streaming Alpha, Star and more. Allows up to 7 simultaneous connections. Strong security with encryption and no-logs policy. 45-day money-back guarantee. IPVanish is a VPN service with 5 servers in Greece and 1,200 servers worldwide. It offers fast speeds for browsing and streaming and works well with a wide range of geo-restricted content, be it Greek TV or streaming services such as Amazon Prime Video. Many people choose IPVanish because it allows up to 10 simultaneous connections via a single account – this is far more than most VPNs and makes IPVanish a great family option. Moving on to usability, IPVanish keeps things simple with its apps which are easy to navigate, even for beginners. Choosing and connecting to servers in Greece is just a matter of clicks, though live chat support is available 24/7 if you encounter an issue. Last but not least, IPVanish secures your device with 256-bit AES encryption, DNS leak protection and kill switch. Your identity is protected thanks to all of this as well as the strict zero-logs policy. You can use IPVanish on Windows, Android, Mac, iOS and Fire TV. Manual setup is required in the case of Linux and routers. GREAT FOR FAMILIES:IPVanish allows up to 10 simultaneous connections, which is perfect for families. It’s quick for streaming Greek TV outside Greece and is also easy to use. 7-day money-back guarantee. PrivateVPN may be a smaller VPN service but it’s fast and ideal for streaming Greek TV abroad. We’ve found it worked well with everything from Alpha to ANT1 with absolutely no issues of lag or buffering. Aside from servers in Greece, PrivateVPN has servers in 60 countries. It works very well in unblocking international streaming services, be it Netflix or Amazon Prime Video. The apps offered by PrivateVPN are well designed and easy for beginners to navigate. It’s possible to connect up to six of your devices via a single PrivateVPN account. PrivateVPN is headquartered in Sweden and states that Swedish privacy laws mean that they don’t keep any traffic logs. Your connected device is secured with 256-bit AES encryption and protected from DNS leaks, while a kill switch cuts internet traffic should the VPN connection drop. PrivateVPN can be used via the apps for Windows, Android, Mac and iOS. Linux and router users will need to configure the VPN manually. HIGH SPEED SERVERS:PrivateVPN is a fast VPN service for streaming Greek TV abroad. Unblocks Alpha, Skai TV and Netflix Greece. Use on up to 6 devices. Offers encryption and has a no-logs policy. 30-day money-back guarantee. Can I use a free VPN to watch Greek TV online abroad? You may find a free VPN that works in unblocking some Greek TV abroad. However, the vast majority of free VPNs simply don’t work well. In some cases, this means that they can’t unblock the geo-restricted content in question. In others, it means that the free VPN servers are very slow. Free VPNs often have a lot of users and actually restrict your bandwidth in order to manage this. This is evident in the lag and buffering you’ll find when streaming. In contrast, the best paid VPNs have thousands of fast servers and can unblock anything from Netflix to BBC iPlayer. Another area in which free VPNs fall far behind in security. Many don’t offer encryption or lack features such as a kill switch. What’s more, many free VPNs actually log your activity and sell this information to third parties. Last but not least, some free VPNs are known to carry malware. If you want a VPN that unblocks geo-restricted Greek TV and protects your online privacy, stick with the safe option of a quality paid VPN. What Greek TV can I watch with a VPN? Remember that the best VPNs have servers in dozens of countries worldwide. You can also unblock geo-restricted content from the likes of the US, UK and Japan. For example, many of the VPNs we’ve reviewed unblock Netflix (including Netflix Greece), Amazon Prime Video, BBC iPlayer, and ESPN. 13 Can I use a free VPN to watch Greek TV online abroad? 14 What Greek TV can I watch with a VPN? 8 Can I use a free VPN to watch Greek TV online abroad? 9 What Greek TV can I watch with a VPN?